Not surprisingly, money is at the heart of the political debate now underway on climate policy, or at least its distribution within the economy. Whilst cap-and-trade is being portrayed as a taxation policy by some, other policy proposals are being presented as being without cost to families and households – both of course aim to reduce emissions. But there are no free lunches here and whichever way the issue is presented, there are costs and benefits involved. For starters, underpinning any approach to emissions reduction is the emissions abatement curve, which plots the cost of emissions reduction against the scale of the reduction opportunity. A perfect approach to reducing emissions starts on the left hand side of the curve and progresses to the right, picking up all potential reductions before moving on. This results in the lowest overall cost to the economy for the required reduction. Cap-and-trade probably comes closest to this. At a given carbon price, the tradability of allowances means that, at least to the extent that market efficiency dictates, the next best emissions reduction project is executed somewhere in the economy. This drives a lowest cost outcome which also minimises the impact on the consumer. But the way in which the consumer sees the impact may differ for different approaches. Under cap-and-trade, with full auctioning of allowances, the immediate effect is that industry will attempt to pass on the cost of allowances and therefore the overall cost of goods and services rises throughout the economy. The extent of the rise for a particular product depends on the carbon footprint of its supply chain or the footprint of the marginal supplier. As a result, consumers also start to change their purchasing choices and the more carbon intense products lose market share or become less attractive to produce – either way they are forced out of the market. In return, the money collected by the government through the auctioning of the allowances is returned to the consumer through lower costs elsewhere, either directly (i.e. a legislated rebate), or indirectly as the economy adjusts to the overall change in money flow and the cost of some other service falls over time (e.g. state taxes). Policies other than cap-and-trade also change the money flow, but their impact on the consumer may be different. For example, government may choose to directly incentivise certain actions within the economy. Initially, money flows from government to the enterprise implementing the emission reduction and the consumer may not be impacted at all. But over time this money must be found through the fiscal process. This may result in additional taxation in some other part of the economy or a new charge on businesses or consumers. If the charge falls on business then this will ultimately be passed through to the consumer in the form of higher prices. A second example could involve the imposition of some kind of standard or regulation. Although in some cases this is by the far the quickest and most direct method of achieveing a result, it nevertheless has a cost impact on the consumer. Eventually the affected businesses may raise prices to pay for the work required to meet the standard. These types (i.e. 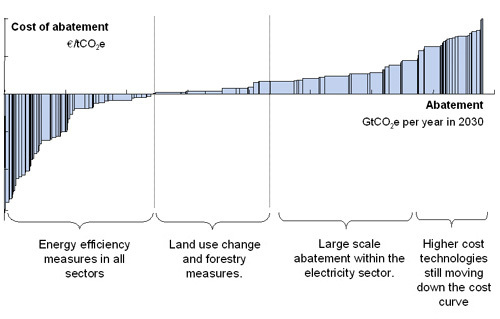 not cap-and-trade) of policy approaches also tend to pick arbitrary points on the abatement curve and require their implementation, irrespective of whether there are lower cost reduction opportunities available in the economy. This means that the overall cost to the economy for a given level of reduction is increased, which in the end may mean a greater burden on the consumer. Whilst this impact may be very indirect and slow to materialise, it will neverthless be there. No matter what the construction looks like at the outset, any net costs to reduce emissions must be borne by the economy. Eventually this will fall on the consumers through mechanisms such as increased prices or changes in taxation. But benefits can also accrue. New jobs may be created as a result of the efforts and other costs reduced, such as for energy. But the overall cost or benefit will be largely dictated by the abatement curve and the efficiency with which the policy instrument tackles it. As an amateur economist, I completly agree with the core message of this post that is: the most efficient way to drive change toward a low carbon economy is by putting a (strong) price on carbon. As you write, this is much more efficient than setting standards or regulations, because with a rising carbon price, the economy actors will choose the less expensive solution to cut their CO2 emission. And you are also perfectly right to explain that with any solution (cap and trade or regulation) the price rise will be supported by the end customer. Where I disagree with your post is that you don’t name the best solution to put a price on carbon that is a carbon tax rather tnan a cap and trade because this price rise is foreseeable, which is key for business investment. *the money is collected on a ww Climate Fund, equally owned by every human being (one life, one share). .Cut of the CO2 emissions of the big polluters (thanks to a rising signal price). .Financial ressources to help poor countries against global warming. A big share of this money must be given back on an equal value per country to help the less rich people in paying for the CO2 cost of their basic way of living. It would be nice to discuss about such clear and global idea. Thanks for the comment. Hopefully you have noticed from previous posts that I strongly favour an emissions trading type approach, such as the EU-ETS and that being considered in Australia and the United States – although both are struggling to gain acceptance. One of the issues with the approach that you propose is that a number of countries simply won’t allow it. For example, I understand that it is not possible within the fiscal rules in the USA to pay a tax into a fund that is then not managed by the US fiscal authorities – this has nothing to do with climate change, it is just the reality of their fiscal jurisdiction. What a pity that the above comment doesn’t get any remark, pro or cons.